The SPC handled and concluded 22,742 and 20,151 cases respectively last year, up 42.3 percent and 42.6 percent from 2015. Its lower courts at different levels, meanwhile, handled and concluded 23.03 million and 19.77 million cases in 2016, also up 18 percent and 18.3 percent respectively. China's court system concluded 45,000 graft cases in 2016, implicating 63,000 people. The defendants included 35 former officials at the provincial and ministerial level or above, and 240 at the prefectural level. Courts at all levels convicted 2,862 criminals of bribery, and concluded 15,000 cases involving corruption, embezzling funds and other crimes found in poverty alleviation. China's courts only handed out death sentences to an extremely small number of criminals for extremely severe offenses in the past ten years. The capital punishment had been strictly controlled and applied prudently since 2007, when the SPC reserved the right to review all death penalty decisions handed out by lower courts. China will step up the trials of intellectual property rights (IPR) cases this year to stimulate innovation and entrepreneurship of diverse entities. In 2016, China improved IPR protection rules by making judiciary interpretations on the trials of certain kinds of cases, including patent right cases. Last year, China tried a series of trademark cases lodged by US basketball icon Michael Jordan, demonstrating the country's stance and determination to reinforce judicial protection for intellectual property rights. Three IPR courts in the cities of Beijing, Shanghai and Guangzhou explored the application of punitive damages to solve problems including low infringement costs and high costs for safeguarding rights. Four IPR tribunals, in charge of cross-regional IPR cases, opened in the cities of Nanjing, Suzhou, Wuhan and Chengdu last year. Chinese courts at different levels concluded some 147,000 IPR cases in 2016, boosting mass entrepreneurship and innovation. China has extended its maritime jurisdiction to cover all seas under its jurisdiction in an effort to resolutely safeguard the country's maritime rights and interests. Courts will strike hard on severe criminal offenses such as murder and robbery, and hand out due sentences for those involved in telecom and Internet fraud, in order to maintain social stability. In 2016, procurators investigated 47,650 people for their suspected involvement in duty-related crimes. 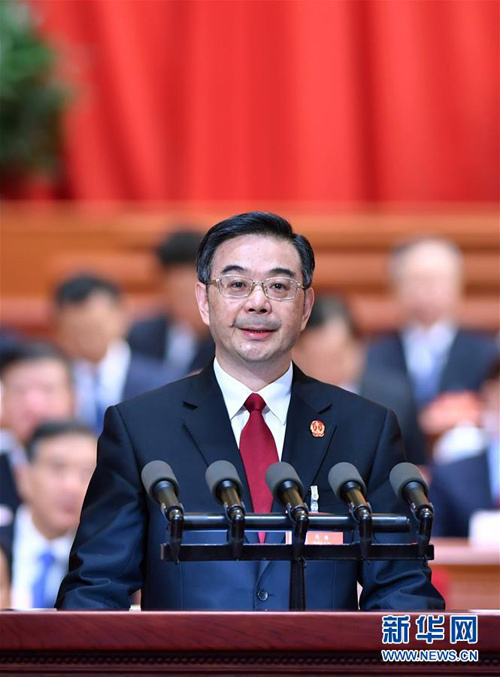 Prosecution proceedings were launched against 48 former officials at the provincial and ministerial level or above, including Ling Jihua and Su Rong, both former vice chairmen of the country's top political advisory body, and Bai Enpei, a former senior lawmaker with the NPC. Procurators also investigated 17,410 lower level officials suspected of corruption in land expropriation and demolition, social security, management of agriculture-related funds and other issues concerning the people's well-being. To severely punish infiltrating, subversive and sabotage activities by hostile forces, violent and terrorist crimes, ethnic separatist activities and religious extremist activities. 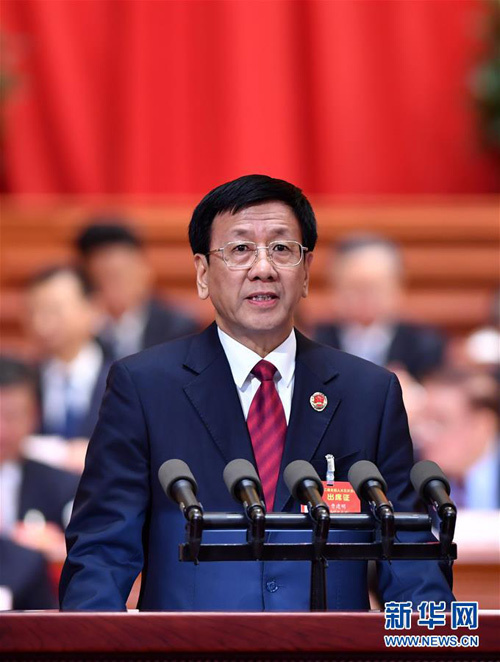 Chinese prosecutors will strike hard on crimes that involve disturbing market order, infringement of IPR and encroachment of special government funds. To strike hard on crimes undermining food and drug safety and environmental protection.